The purpose of bosting out is to develop the internal planes of the carving to a close approximation of the finished piece. Heavy cuts can be made at first, but as you approach the final surface of these planes, lighter and lighter cuts should be made until you have taken enough stock away so that the form is very close to that you show in the drawings. At this point you will realize why I stressed the necessity of fixing the detail in your mind by careful consideration of all the aspects of the drawing and the form that you want to develop. Somehow or another, you know when you have gone far enough. With a little practice you will find that you seldom overcut your carving. When you have one side of the design bosted out, proceed with the other. They will be more or less alike if the same process you followed in making the original cuts are duplicated. A great help in this process is to set the low points on the sides of the piece. I do this by using the scribe, measuring each point or reference spot from the surface of the hold-down to the low points of the carving as they are to show on the sides of the profiled piece and transferring these low points to the corresponding positions on the other side. Then bost out the stock to those markings. 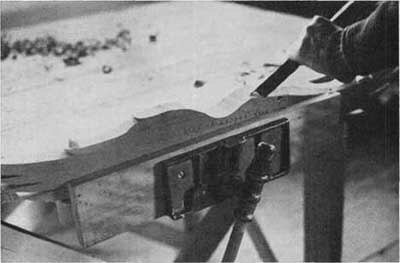 If it happens that there is a difference in the design for the carving on either side (as in the case of the picture shown in Image 50), but there are points where the same amount of stock is to be bosted out on each side, use the straightedge placed across the areas concerned and measure down from the bottom of the straightedge to the surface of the bosted section. Then measure down from the bottom of the straightedge to the corresponding section on the other side. The difference in the depths will be shown, and these differences can then be corrected. If, as sometimes happens, you have removed too much stock on one side, the differences in depths will have to be reconciled by removing stock on the side of the carving that is higher than the other. This process of bosting out should be done on all parts of the carving that can be reached conveniently while the blank is fastened to the hold-down. Do not attempt, at this time, to do any detailed carving. You may have to remove the blank from the bench and the hold-down so that you can back-cut the reverse side. Back-cutting (as its name implies) is cutting away stock from the back of the carving. This is done, in many instances, so that the profile can be finished in such manner as to give the effect of a third dimension. It might be called an exaggerated chamfering process. If finished detailed work is done before the back-cutting is undertaken, the probability is that it will be damaged. 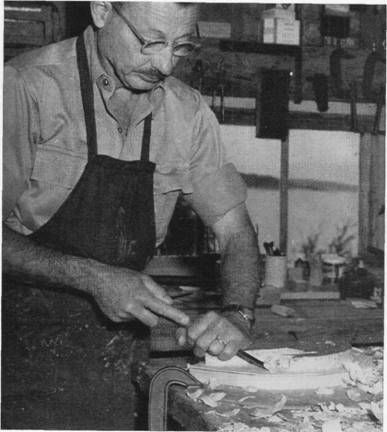 There are many cases, of course, where back-cutting is not to be donewhere the straight or vertical edge of the carving will add to the final appearance of the piece. This fact you will have to decide for yourself. In the case of a large and intricate compound carving, all the various pieces will have to be bosted out before any detailed work is undertaken. 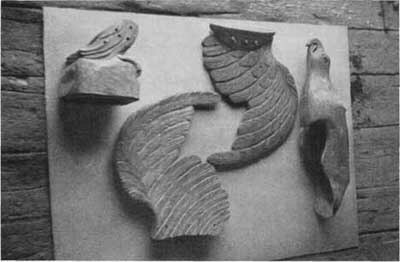 In the construction of the large American Eagle that is shown in one of the illustrations, each piece was profiled, bosted, jointed, drilled, counter-bored and screwed before any detail carving was undertaken. The purpose of this was to be sure that the planes of each sidethe wings, the body, the claws, and the base blockwere as nearly alike as it was possible to make them. Parts for one of a pair of large American Eagles. Note that the base block with claws and legs and the wing surfaces are detail-carved, but no detail carving is done on body section. This should be done after all parts are assembled so that the detail carving on the body will run with the detail carving on the other sections. When all the parts of this eagle were assembled, the differences became apparent and they had to be reconciled. In all the many pieces that were involved, I had to take reasonable care to see that I did not overcarve. As there was a pair of these eagles, it meant that each piece on each eagle had to be reconciled with the corresponding one. It sounds intricate, involved, and difficult. It wasn't, really, because I knew beforehand that this would have to be done, and I provided for this contingency as I went along with the work. Had I not anticipated this, the work would have been much more difficult to execute. And speaking about these eagles, it may not be out of place to tell how they came about. About the middle of May, 1954, I had a telephone call from a man in Waldoboro who wanted to come down to the shop if I was going to be here. I asked him along. About twenty minutes later a big, tall, heavy-set, good-looking man came in and introduced himself as George Hand. 1 couldn't see the connection between his company and my work but 1 am always willing to learn. So we started to talk. I was working on a rather complicated carving at the time and he began to ask me a lot of questions about my work: how long it took me to make a carving, what I charged for my things, and all sorts of stuff. We had gotten to the point where he wanted to know if I was tooled up to carve a pair of big American Eagles. I showed him what tools I had and what they could do. I gave him some idea about what I charged for my work and why. About this time, "Jake" Day came in. "Jake," Maurice Day, is the feller who draws all the amusing animal pictures, full of delightful whimsey. He is also a most gifted painter, as well as being a great authority on the Baxter State Park up around Katahdin. Jake "histed" himself up on the corner of the bench and busied himself at something or another. I had introduced these two men and they hit it off. 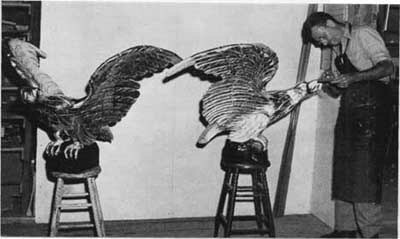 George Hand asked me if I would undertake to carve a pair of six-foot wingspread American eagles. I asked him what they were to be used for. He told me that they were to go on the pilot houses of a big ocean-going tug and a big dredge his company operated in the Gulf of Mexico. I thought this over for a moment and said that I would undertake such a commission, but not that big. 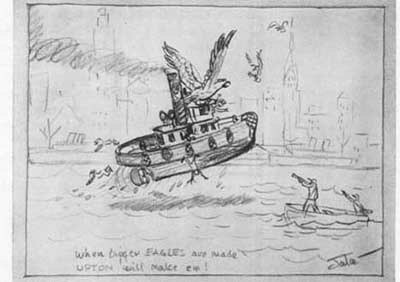 I said that a six-foot eagle mounted on the pilot house of a tug would spread enough sail so that if the tug got into one of the big blows they get in the Gulf, the next thing they knew the Eagle would take off with the tug in its talons. George insisted that the carvings be done as large as this. I said I thought it would be a good idea if I drew up a couple of sketches of these birds, one with a four-foot wingspread, the other with a six-foot wingspread, and let the head of the house choose which one he wanted. Which was finally agreed upon. I told George that I would send along an estimate of the cost of both of these birds, too. So, that seemed to satisfy both of us, and George took off. Jake and I talked some about the project at hand and he went back to Damariscotta. The next day I got an impressive-looking package in the mail from Jake. Its contents are pictured in Image 41. I made the four-foot eagles. It took a full three months from start to finish, and they were really big. Some comment about various clamps may not be out of place. I have already described the long clamps used for edge glueing and you are probably familiar with the common iron or steel C clamps that are available. 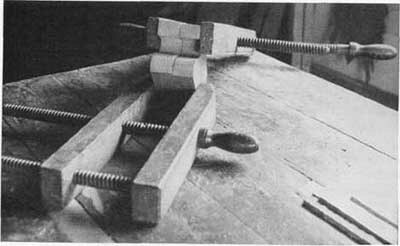 One of the most useful, and unfortunately scarce, kind are the old-fashioned wooden clamps made with two wooden screws and two wooden jaws such as are shown in Image 42. I don't think these are made any longer. I got the ones I use at a country auction years ago. I think I paid half a dollar for the lot. There were six of them offered up for kindling. The old-fashioned wood jaw and screw clamp in use. They are heavy and clumsy for small work, but what a job they do if they can once be set up. My suggestion would be to scour the countryside for them. The old cabinet shops used them, blacksmiths used them, old boat builders used them. Mine are not for sale. Drill two 3/8-inch holes in part A, 1 inch in from either end on centerline. 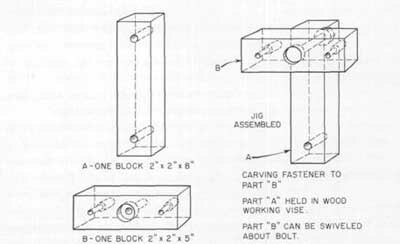 Drill one 3/8-inch hole across centerlines on B. Counterbore to ½-inch with 1-inch bit. Drill two 3/16-inch holes on centerline on B-about 3 inches apart on centers. Counterbore these holes on face opposite the 1-inch counterbored center hole, using %-inch counterbore to depth of 1 inch. Use 2-inch #10 round-head wood screws to hold carving. Assemble both parts of jig with 3/8-inch x 5-inch carriage bolt, nut, and washer.